Design is currently underway for the Purple Line, a proposed 16-mile light rail line with 21 stations, which will run from Bethesda to New Carrollton and provide direct connections to Metrorail, local and inter-city bus, the MARC train and Amtrak. An east-west route connector for Montgomery and Prince George’s counties, the Purple Line has been under study since 1992. The Maryland Transit Administration (MTA) is the lead agency for the Purple Line project. On August 5, 2013, Governor Martin O’Malley announced that the Purple Line would be designed, built and operated by a private firm. Ridership forecasts for 2040 exceed 74,000 for a typical weekday. The total estimated capital cost is $2.2 billion. The MTA Office of Transit Development and Delivery submitted a Purple Line Mandatory Referral Amendment related to the Purple Line alignment and platform location at the Silver Spring Transit Center Station. This modification to the plan initially reviewed by the Planning Board on March 20, 2014 involves a change that will result in (1) the Purple Line alignment crossing Colesville Road at a different angle and (2) the placement of the station platform on the north side of the Silver Spring Transit Center (at the third level adjacent to the kiss-and-ride drop-off) instead of the south side nearer to the Metrorail and MARC/CSX tracks located at an elevation approximately 80’ above Colesville Road. There is no change to the Capital Crescent Trail near the Silver Spring Transit Center. This amended plan for the Purple Line alignment and station location at the Silver Spring Transit Center will continue to be refined as Preliminary Design for this change progresses through 2017. The Planning Board reviewed the amended plan at its June 16, 2016 meeting. For more information, see the plans on the Planning Department’s web site. 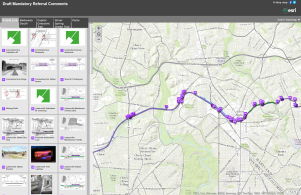 The Montgomery County Planning Board held a public hearing on the mandatory referrals for the Purple Line, the Bethesda Metro Station South Entrance, the Capital Crescent Trail, and the Silver Spring Green Trail on Thursday, March 20, 2014. The Planning Board reviewed the four projects and forwarded comments to the Maryland Transit Administration, the Maryland State Highway Administration, the Montgomery County Department of Transportation, and the Maryland Department of Transportation. In an effort to assure compatibility with communities and businesses along the right of way, many of the recommendations concern ways to improve station access for pedestrians and bicyclists, enhance urban design along the corridor, reduce environmental impacts, mitigate impacts to parkland, and improve transitions along the Capital Crescent Trail. The Purple Line Functional Plan was adopted by the County Council in September of 2010, and includes, a series of recommendations for the proposed transit line’s route, mode and stations. Download the approved and adopted Purple Line Functional Plan [PDF]. In addition to the Purple Line Functional Plan, several Master Plans and Sector Plans along the alignment have either been adopted or are in progress. These include the Bethesda Downtown Plan (underway), Bethesda Purple Line Station Minor Master Plan Amendment (adopted), Chevy Chase Lake Sector Plan (adopted), Greater Lyttonsville Sector Plan (underway), and the Long Branch Sector Plan (adopted).